I had a hunch that the webpages were deploying text less text than the used to. 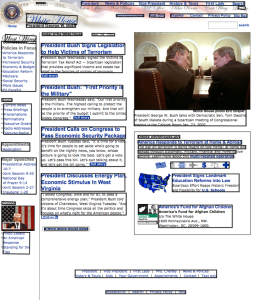 I put together a study that looks at the use of text on webpages since 1999, using the Internet Archive’s archived webpages in the WayBackMachine. I found that indeed there has been a decline, beginning around year 2005. Update (Oct 17, 2015): I have also blogged about this study on the CILIP blog and the Web Archives for Historians blog.